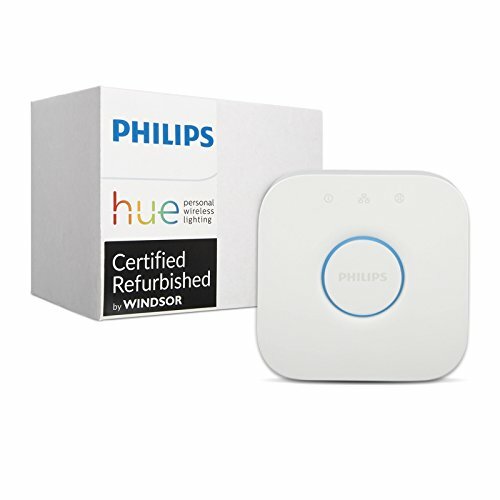 The Philips Hue 2nd Generation Bridge is the heart of the Philips Hue system; it lets you control all of your Hue products with the Hue app even when you are away from home. Without it, your smart lights are just normal light bulbs. Once coupled with Amazon Alexa, Apple HomeKit, or Google Home, the Bridge lets you use voice control to tell your lights what to do. It also syncs seamlessly with pre-existing Nest and SmartThings systems. The Bridge plugs directly into your router, so setup is easy. Once plugged in, you can sync up to 50 Hue lights and up to 12 accessories (sold separately) using ZigBee connectivity, enhancing your Hue experience even further.